Five years into President Obama’s administration and more than six years after the recession began, unemployment is the biggest concern troubling the minds of Americans, according to a new Gallup poll. Americans, it appears, are not buying the rosy White House line about all the jobs being created and all the “consecutive months” of job growth. They get that the unemployment rate is going down because people are giving up the search. And most of all . . .
THEY’RE LOOKING FOR JOBS AND CAN’T FIND THEM. WHAT HAS OBAMA BEEN DOING THE LAST FIVE YEARS?? Notice the disconnect between what Americans care about and where Obama’s head is at. 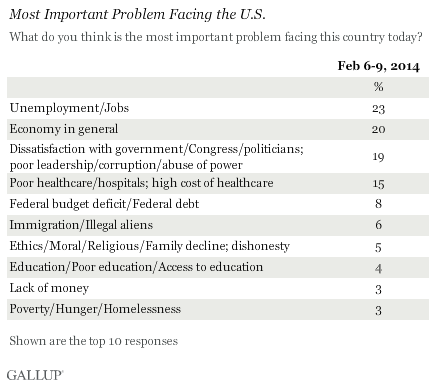 Health issues are fourth on the list, viewed as the biggest problem by only 15 percent. Immigration, Obama’s top second term policy priority, is the top concern of just six percent of his subjects. And Obama’s overriding second term focus, “income inequality” – as represented by the category “poverty/hunger/homelessness” – comes in tenth at three percent. Gun control didn’t even make the top ten. We have a president pursuing his own ideological agenda while the nation continues to suffer. And nothing will change for the next three years. So let’s learn to love it! Oh, who cares? Let’s play Candy Crush! It’s better than Soma. Good golly Miss Molly–are we going to have to hide the substances? well Candy Crush is going Public. So if all those that are addicted to it should buy the ipo. Another IPO based on basically air…this stuff gives me the jeebs. I am personally astonished that conservatives and business people are not jumping all over the observation that raising the minimum wage will hurt the current unskilled actually looking for a job. Does Obama actually believe that these people stand a chance of getting a job paying $10.10 an hour versus the current $7.50. And doesn’t this play into the concern as noted in the poll showing the greatest concern of 23% of people surveyed view unemployment their greatest concern. Simply stated: raising the minimum wage will help those who are able to retain their minimum wage jobs. It will hurt those who are laid off as a result of the new requirement and, of course the current unskilled unemployed. It would be nice if the media were interested in this. Time (magazine) sure perked up over Obama’s drought/golf hypocrisy…. There ARE jobs out there, but it’s where the jobs are located and the requirements necessary that are the problem. A unemployed coal miner living in a hollar in WestVirginia won’t find a job in his hometown, and doesn’t have the skills necessary to get a job in Roanake at the Motorola call center. Thousands of now unemployed farm workers in California aren’t going to get a job at IBM. College grads with degrees in social studies are out of luck and will live in debt for the rest of their lives. MrObama has the right idea with his re-educating the unemployed to meet modern job opportunities, but it’s only part of the solution. The other part is to relieve private enterprise from the heavy boot of government regulations and demands. Apparently, the only ones for whom this program worked, were those who were employed by it. Years ago, we took applications through Michigan Works looking for a new employee. From what I saw (personally, with my own eyes) it was nothing but a job-application scam to pretend that people were looking for work. Everything about “Obama” is a scam – from his Identity Fraud, forward. I blogged the other day about apprenticeship programs–few and far between–but industry needs to train people to its needs not wait for the govt to make junior colleges do it or make out-of-work employees pay for advanced training. http://hopeycopey.blogspot.com (usual disclaimer–I make no money off your reading this). Ex-convicts and gangbangers are getting ‘green collar’ job training in L.A. County, primarily in solar panel installation at schools and Federal bldgs. Non-felons need not apply. Next question: WHY DOES ANYONE LISTEN TO AKA OBAMA? What’s funny is Jay Carney saying that they want to save people from doing jobs they hate and choose not to work. I guess they can’t keep giving glowing reports of all the jobs they’ve created. …don’t forget saved. That dopey term came up on the morning blabs. They’re not even TRYING to be honest at this point. Why should they? If their spin gets shoveled onto the sheeple by an uncritical press, and the sheeple will just sit there and slurp it up, why NOT try to tell the press that everything’s cheeky-peeky? Heck, why stop there? Sooner or later, Carney Barker will try to tell the press that war is peace, freedom is slavery, and ignorance is strength. And the press will just pass it right along as if that were incontrovertible fact. NO. And he probably read the Cliff Notes on the Constitution. There is no domestic policy, there is no foreign policy, there is only golf, movies, travel, travel and more travel. Preezy Cloward-Piven is on a mission. Iran has a foreign policy! The U.S. has accepted the continuation of Iran’s nuclear enrichment program, an Iranian official said Sunday, a claim the Islamic regime’s media have also reported recently, citing comments by U.S. delegates to their Iranian counterparts at the Geneva 5+1 negotiations. “The Islamic regime will never abide by the politics of America or any other country and has paid the price (through sanctions) to stick with its own policies,” Alaeddin Boroujerdi, chairman of the foreign policy and national security committee of the Iranian parliament, said in a meeting with Brazilian Senator Valdir Raupp, according to the regime’s media outlet ISNA. In discussing the nuclear negotiations with Raupp, Boroujerdi said plainly that the Obama administration has accepted Iran’s right to continue nuclear enrichment. ….and a pen and a phone (the other two branches of govt). While Immigration is only #6 on the list it should be higher. At current Immigration and birth rates we are projected to have 1 BILLION in the United State at the end of this Century. That’s three times what we have now. The problems are only to get worse. Has the Republican Party come out with a jobs and economic revitalization platform? Another created crisis that didn’t even make the top 10 is globull warming (aka climate change). Yet, Lurch Kerry is jetting around the globe preaching that it is the “world’s most fearsome weapon of mass destruction”. The ruling class elites have no idea, nor do they care, what the American people are concerned about. I agree, Susan–people are practical–they listen to these overblown, fiery-hair things like climate change is a weapon of mass destruction–and think, you know, I may only have 25 yrs left, my family needs to eat, many so-called scientists say if we did totally cut consumption and force better mileage and make everyone buy expensive solar panels it would not change a whit–and those people just put their heads down and do “today”—look for a job, try to find out if they have insurance or not, console the kid who isn’t working and wrack their brain about who he or she could call, some family friend…practical things. Kerry et al can waft around the world or drink Appletinis at Davos or whatever, but people have other things on their minds. I know many people who were layed off, just before O Care came into effect. So I don’t want to here O’s comments on the solutions to the unemployment. Some people are not hiring because of O Care, Some people are not hiring because of being uncertain of the economy. Some people are not hiring because they do not know what this pretend I am a Dicator is going to pull next. The list goes on. Also someone needs to explain to him the number of people who were already out of work, that did not appear on the new count. a crackhead bumming modify), so they pony-up $. Candy Crush degree seventy six introduces you to an solely new challenge: transporters.